Serving as legal counsel in personal injury cases means our team knows that first responders save lives. We are incredibly grateful for the commitment emergency personnel make to San Francisco and its people. We are humbled by their bravery. Emergency personnel are indeed superheroes, but they are also human. Fire truck accidents and other accidents involving, and sometimes caused by, emergency vehicles are a reality. Both during emergencies and in non-emergency situations, drivers of police cruisers, fire trucks, and other emergency vehicles must never forget they are still drivers and that driving carries responsibilities whether you are a superhero or a civilian. People injured by these vehicles deserve the protections afforded to all accident victims. Our San Francisco emergency vehicle crash lawyer knows these are complex cases that are far too common and we help victims recover due compensation. San Francisco Fire Truck Collides With Bicycle Rider Sadly, the notion of emergency vehicle accidents became a terrifying reality for one bicyclist over the weekend. As reported by the San Francisco Chronicle, a fire truck was returning to the station and headed southbound on Mason Street in the Tenderloin at approximately 2:15 Saturday morning. The fire truck collided with an unnamed bicycle rider at the signaled intersection with Turk Street, mere yards away from Market Street. The truck did not have either its emergency lights or its flashers activated. The accident left the rider, a man in his 30s, with serious head injuries. He remained hospitalized as of the Sunday afternoon report. No fire personnel were injured in the collision. The fire truck operator tested negative for drugs and alcohol. Officials do not yet know who was a fault, but a police investigation is ongoing. Police are expected to examine security footage from area businesses, most of which were closed at the time of the crash. 30,000 Crashes Per Year Involving Fire Trucks in the United States Fire truck accidents are, sadly, not uncommon. In 2012, the Association for the Advancement of Automotive Medicine published a study focused on injuries incurred by firefighters in fire truck crashes placing the rate at approximately 30,000 crashes per year. That figure, based on research from the ten year span from 2000 through 2009, shows a notable increase over earlier research. A Participant Guide for a workshop run by the International Association of Fire Fighters cites a 1998 study that, based on three years of data, found an average of 2,472 fire apparatus collisions in the U.S. each year. California Fire Engine Crash Attorney on Responsibility & Representation In at least some fire truck accidents, as with other emergency vehicle crashes, fault lies with emergency personnel. In January, the Los Angeles Times reported on an investigation into a crash last spring that involved two fire vehicles colliding and sent one crashing into a restaurant. The investigation concluded that unsafe driving by one of the firefighters caused the incident that injured nine civilians and six firefighters. While the party at fault there was a driver, fault could also lie with a mechanic, a policymaker, or someone else involved in overseeing and utilizing emergency vehicles. A forthcoming post will examine the legal standards that apply to collisions caused by emergency vehicles. For now, we want to reiterate that we are incredibly grateful to the first responders who risk their own lives for others. 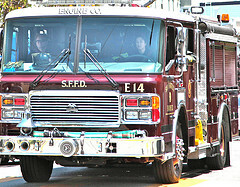 We also represent those injured in emergency vehicle accidents in San Francisco and throughout Northern Californian. We do not believe this poses a conflict. Our ultimate commitment is to the safety and well-being of residents of and visitors to the Bay Area region. Emergency vehicle drivers must not forget that they are just that, drivers. Superheroes, like civilians, must drive responsibly. If you’ve been hurt in a crash caused by a police or fire vehicle in Northern Californian, you have rights. Please call to arrange a free consultation with our fire and police car accident attorney in San Francisco or at one of our other convenient offices in Santa Rosa or Oakland.